All winter long I birded the old Edgemere Landfill, especially after the surprising Le Conte’s Sparrow just before the Queens Christmas Bird Count. The site is just too interesting, too potentially good for vagrants, too underbirded, and too picturesque not to bird it as a Queens birder. And, yes, I understand that calling an old landfill picturesque might sound odd to you but when you consider that from up on top of the capped dump you have a long-range view of the Manhattan skyline, a bird’s-eye view of JFK International Airport, and a great view of a large chunk of Jamaica Bay’s marshes, you understand where I am coming from, I hope. 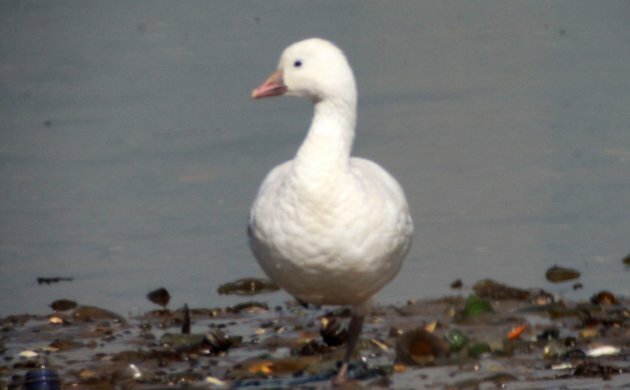 Anyway, one of the birds I looked hard for all winter was a Ross’s Goose, the diminutive species that looks like nothing but a very small Snow Goose. 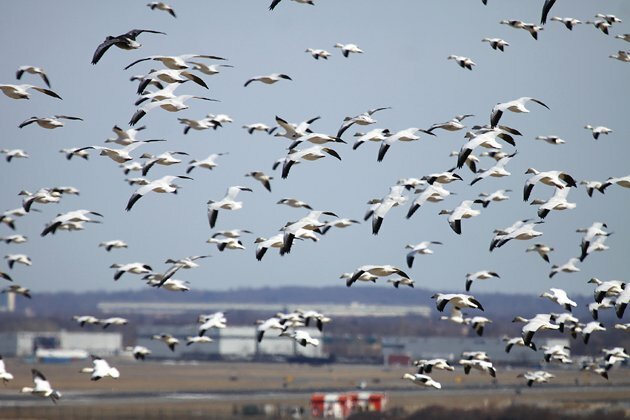 It made sense to search Edgemere Landfill for a Ross’s Goose because of the thousands of Snow Geese that spent a large portion of their winter there, feeding on the abundant vegetation. 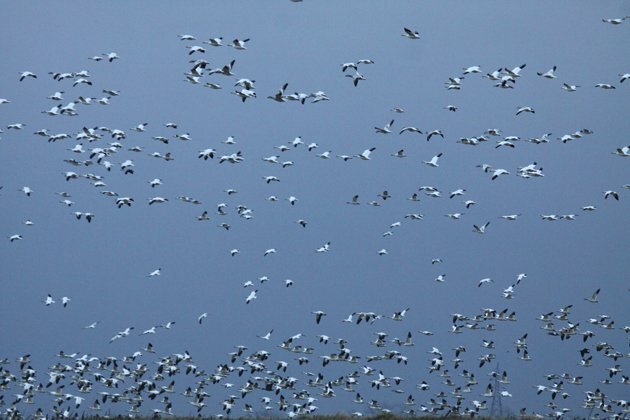 I never had any luck finding a single Ross’s Goose in the large flocks and other birders who spent time there doing the same thing never had any luck either. 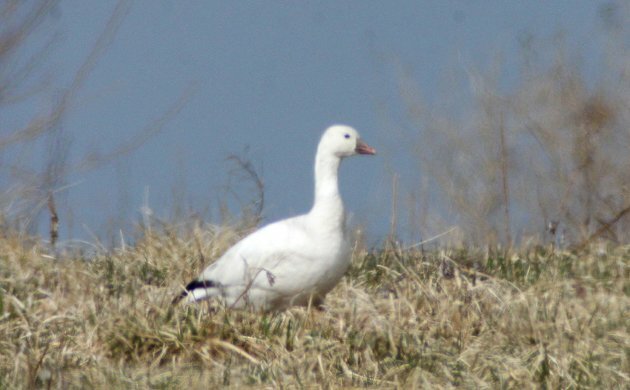 By the time I stopped by there on Friday morning I knew the Snow Geese had already departed and I wasn’t even going to look for a Ross’s Goose. My only goal was to see if any interesting early migrants were using Edgemere as a stopover site before continuing north. 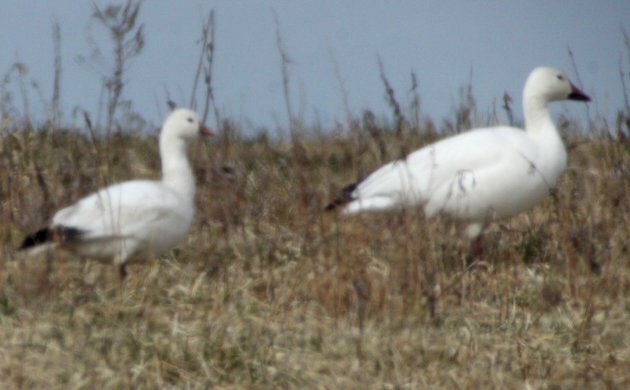 You can imagine my surprise when I saw four white geese out on the grass of the landfill and one of them looked significantly smaller than the other three. I got the scope on them and the little one looked really good for Ross’s Goose. I walked closer and confirmed my suspicions. Sweet, Ross’s Goose! And a much better look than my only previous Ross’s Goose in Queens! 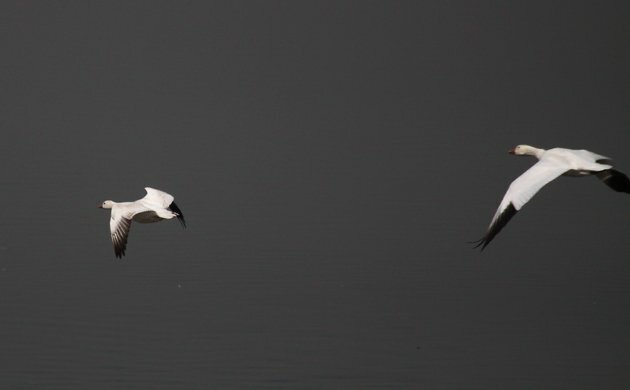 The birds eventually flew down to the water’s edge where I got even better looks and, even better, got Isaac Grant, who is doing a New York City big year and who I had called knowing he still needed Ross’s Goose, on the bird. Not a bad find for early April in New York and yet another reason to continue to bird the underbirded areas in Queens! Any more pictures? Think it’s likely the head angle but bill looks a bit odd in the bottom solo shot. Lots more – and, yeah, it does look weird in that shot. Nice find and cool pics! Sounds like a great birding spot. I hear you on birding the underbirded areas! Last week, I watched a male Bare-necked Umbrellabird while guiding along a very underbirded, well transited road in Costa Rica. We had fantastic close views as tour buses drove on past.